The 15 inch 7 mile long Ravenglass& Eskdale Railway (also know affectionately as La'al Ratty) runs from the Cumbrian Coast through two of the most beautiful valleys in the Western Lake District. 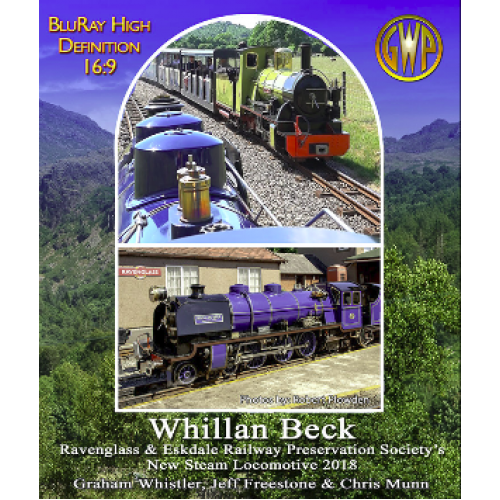 This all new film features Whillan Beck, Ravenglass & Eskdale Railway Preservation Society's new steam locomotive, now fully restored and in service on the railway in July 2018. It was formally known as "The Train from Spain" and early footage in Spain and rebuilding and testing in Ravenglass in in our new R&ER 2017 Bluray/DVD. Some of the railways other steam locomotives are also featured. The film will take you on the complete journey featuring Whillan Beckwith cab ride and dramatic trackside action. There are some all new amazing aerial drone scenes of the new locomotive and the railway skillfully filmed for us by Chris Munn. GWP had perfect filming weather. Filmed and driected by Graham Whistler with high definition Sony equipment. Edited by Jeff Freestone. R&ER retired General Manager Trevor Stockton gave help with the script. Running Time Total - approx. 75 mins.